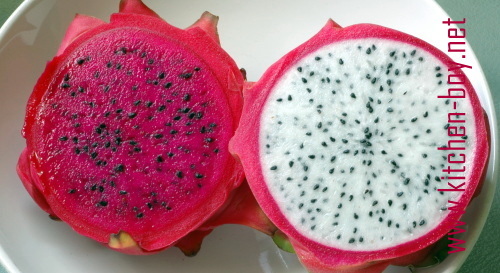 The Pitaya (as it is know in Mexico, or Fire Dragon Fruit (huǒ lóng guǒ in Mandarin Chinese) as it is known here in Taiwan, is a member of the cactus family. The plant is native to Mexico but is widely cultivated and eaten throughout Asia. In Taiwan we get them in mainly two varieties, white and almost scarlet red. Despite the fact that this fruit is violently colourful, out and in, it is the taste, or lack thereof that people comment on. For me the taste is almost a cross between a melon and a prickly pear, but not as sweet and quite watery. For this recipe, it was the vibrant colour I was after and not the taste. Although the batter was a beautiful, bright pink, unfortunately the colour didn't make it to the baked stage. 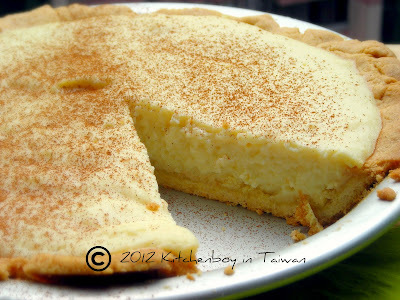 The cake is fluffy, light and delicious though, so do give it a try. Cream the sugar, oil, eggs and salt in a large mixing bowl until the sugar is dissolved. Sift the dry ingredients into the egg mixture. Add vanilla extract, if using. Stir in the bananas and dragon fruit until well combined. Pour mixture into a greased loaf tin or bundt tin. Bake for up to an hour if using a loaf tin, or about 45 minutes if using a bundt tin. If a wooden skewer,inserted in the middles comes out clean, the cake is done. Dust with some icing sugar just before serving. Don't have any Dragon Fruit? Why not try this Carrot and Banana Cake instead? Similar and delicious!